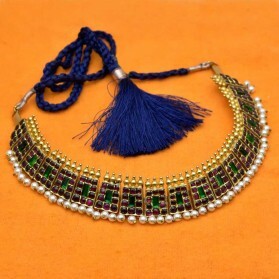 This classic temple jewellery Adigai necklace has single line big Green emerald stones with a Pearl hanging Pendant. 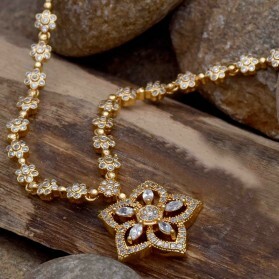 It gives an ethnic look when coupled with traditional wear or dancewear. 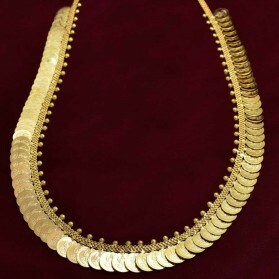 This necklace is used by actresses and performers at the temple and classical dance like Bharatanatyam, Kuchipudi and Mohiniyattam. Also widely used by South Indian brides. By buying this product you can collect up to 556 loyalty points. Your cart will total 556 points that can be converted into a voucher of ₹ 111.20. 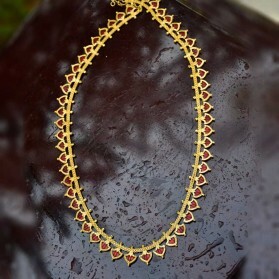 Category Temple jewelry, is largely made of silver, finished with gold leaf work. Its studded with spinels, Kemp and pearls. 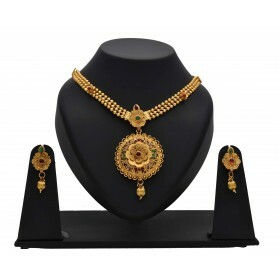 Traditional temple jewelry ornaments are used for Indian classical dances and as bridal wear.